More than 35,000 finished this gruelling race yesterday. Everyone, runners, supporters and contributors were simply amazing raising £450 million for charity. The elite athletes made record breaking times. 2hrs 5 mins for the men and 2hrs 22 mins for the women. Everyone who ran give yourself a pat on the back and a big congratulations to Stephan. Congratulations to Stephan. My daughter runs in marathons. I don't know how she does it. I've made it a goal to do the London marathon myself. I have so much admiration for those who endure it! One of my nephews used to do this but I haven't heard from him this year. I admire these athletes and I'm amazed at the amount of money raised. That is incredible given the economic times. This reminds me, did you get any photos of Slow Down London?? Hi this is my first visit to our blog and I'm glad I made it. It's a big of a marathon in blogland! Great action shot. I get tired just looking at it let alone run it! Great shot and a wonderful cause. Thank you so much Mo. It was a hard race in the sun but it was fun, great atmosphere, fantastic crowds all along the way and I've never drank so much Lucozade in one day like yesterday. 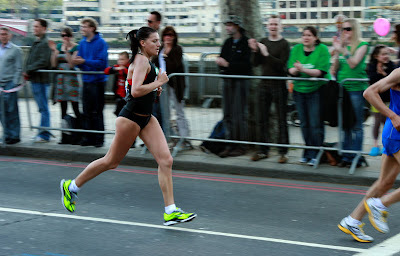 The next run is around the corner on 25 May 09 - BUPA 10,000 - its a 10k race through London. Are you training for next year? This is a brilliant sport shot. I know how hard they can be to get too.